Kentucky is currently one of only six states that assess a separate inheritance tax on certain property owned by a Kentucky resident and real estate, and tangible personal property located in Kentucky that is owned by a non-resident. The other states that collect a state inheritance tax include Iowa, Maryland, Nebraska, New Jersey, and Pennsylvania. Class A - Class A beneficiaries include the deceased person's surviving spouse, parents, children (by blood or adopted), grandchildren (by blood or adopted), stepchildren and step-grandchildren (by blood or adopted), brothers and sisters (whole or half), and certain charitable organizations. Class A beneficiaries are ​completely exempt from paying the Kentucky inheritance tax. Class B - Class B beneficiaries include nieces and nephews, half-nieces and half-nephews, daughters-in-law and sons-in-law, aunts and uncles, and great-grandchildren (by blood, by stepchild, or by child adopted during infancy). Class B beneficiaries are eligible for an exemption of $1,000 each. Class C - Class C beneficiaries include anyone not listed above as a Class A or a Class B beneficiary. Class C beneficiaries are eligible for an exemption of $500 each. Only life insurance that is payable to the decedent or the decedent's estate is included in the value of a Kentucky estate for state inheritance tax purposes. For a chart showing the inheritance tax brackets, refer to pages 6 and 7 of A Guide to Kentucky Inheritance and Estate Taxes. If no Kentucky inheritance tax is due and a federal estate tax return (IRS Form 706) is also not required to be filed, then it will not be necessary to file a Kentucky inheritance tax return. Instead, an "Affidavit of Exemption" will be accepted for the final settlement and closing of the administration of an estate. For estates subject to the Kentucky inheritance tax, a Kentucky Inheritance Tax Return (Form 92A200, 92A202, or 92A205) must be filed and the inheritance tax paid within 18 months of the decedent's date of death, otherwise, interest and penalties will begin to accrue. If the inheritance tax is paid within 9 months of the date of death, then a 5% discount is applied. 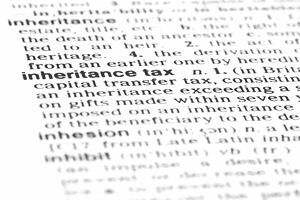 For more information about Kentucky inheritance taxes, refer to Kentucky Inheritance and Estate Tax Forms and Instructions. You can also write to the Financial Tax Section, Department of Revenue, Frankfort, Kentucky 40620, or call them at (502) 564-4810.